Kieran Tarr, application sales engineer for X-STK is first on the left and Andy Haly, sales director for X-STK is fourth from the left. 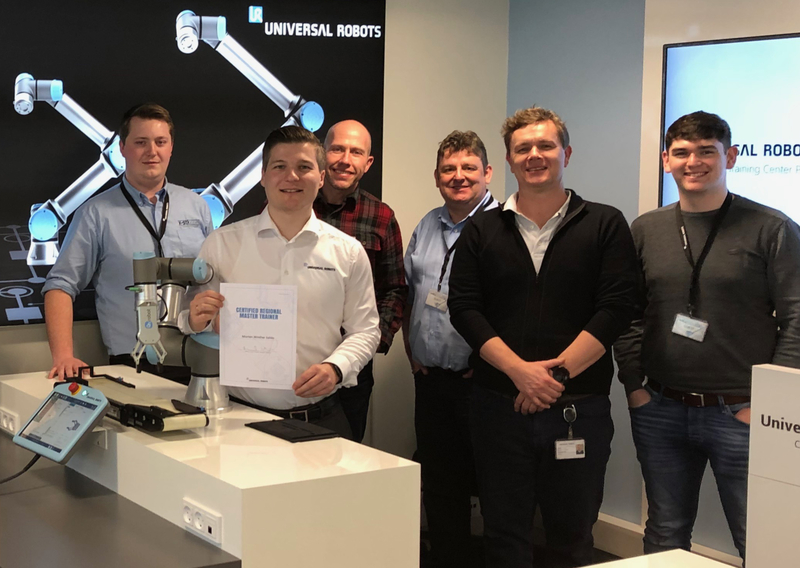 Two members of Applied Automation’s X-STK team have returned from a week of intensive training at Universal Robot’s headquarters in Denmark recently to enable them to become authorised Universal Robots trainers. Universal Robots is the leading manufacturer of collaborative robots. The Authorised Trainer Program is a three day course. It focuses on the delivery of UR content that makes up the core training. This covers teaching methods, people skills and dealing with various scenarios, as well as some excellent practical content. The next step is an assessment day. Universal Robots visits the premises of anyone aiming to be authorised trainers. This is to make sure the equipment and trainers meet the required standards before letting them loose with valued customers. Once this stage has been passed it means X-STK will have two Universal Robots authorised trainers. X-STK is the product sales and distribution division of Applied Automation (UK) Ltd. Applied Automation have been machine builders for over 30 years. X-STK (pronounced ex-stock) is the product sales division of Applied Automation is able to draw on that knowledge and offer effective solutions for their customers. X-STK | Applied Automation continues to expand its product range, building on established long-standing partnerships with global brands including Omron and SMC, Universal Robots, Rittal, Weidmuller and Eaton.